As a poet, much of my time is spent searching for the perfect word—le mot juste. There are reasons for this, that go beyond wanting to create something pleasurable or even beautiful. It’s because words have power. They can change the way we see the world. They can change the way we relate to one another. They can create meaning or destroy it, instantly, and sometimes thoughtlessly. They open our eyes and challenge our understanding in the deepest, most powerful way. Don’t believe me? Just look through the pages of any history book and you’ll see, at the heart of any major historical event (minor one too), is a powerful speaker rallying people, for good or evil, towards a shared goal. Look through the pages of any advertisement critically, and you’ll begin to see the motivational messages that drive people to put their hands into their pockets. There are all sorts of ways to influence people, but words are always the key. Words create images which build expectation, emotion, impressions, and ultimately action. So choosing the right word is important, and not just for poets, though poetry goes into the heart of humanity and winkles out all those little shiny bits you’d missed, forgotten, lost. If you allow yourself to live only in easy cliché, letting the advertisements, catch-phrases, and trite sentiments slip easily from your tongue in conversation, you may find that you don’t end up saying much at all. Your perceptions dull. Because you aren’t trying too hard, you don’t make connections with people in the same way, and nothing really sparkles. Try looking just a little harder. Even casually, you can move beyond “fine” when someone asks how you are. Try the truth. And then give them time to speak the truth in response, and really listen to what they’re saying, and before you know it, you’re communicating. That’s something real, and special. Next time you’re writing (or better, making) a greeting card for someone, trying saying something to them that really encapsulates what you feel about them—something fresh and deep, or light and fun, but something that no one else can say, because it has come from your own individual years of experience, your own emotions, and your own unique perspective of that person. That’s a gift you can’t buy. Of course not everyone’s a poet, and not everyone has a way with words, but there is plenty of poetry on offer, and poets ready to force you, willing or unwilling, to look at your own life and the lives of those around you in different ways--to close in and see things from a perspective you’ve never seen, or to open out and grasp the totality of an experience in ways that change you. Real, deep, thoughtful words—the words of poetry—are as vital now as ever, and not just for formal occasions. Words form a critical link between us—a critical bridge to ourselves—that exists beyond the quick and easy media grabs and sloppy exchanges that surround us. We should care about the words we share. We should share words that matter. Today's guest blogger is Martha Swirzinski, author of the Movement and More series of books for young children. Martha holds a Bachelor's degree in therapeutic recreation from Clemson University and a Master's from the University of Maryland in Kinesiology. With more than 15 years of experience working in the field of movement with children and adults, she knows a thing or two about the value of movement education and the value of structured movement for children. Using entertaining rhymes and charming pictures, these developmentally based books offer fun and creative ways for children to move while also providing mind stimulating activities on each page. By following the suggested activities, children can engage in 30-60 minutes of their recommended structured daily movement, as well as enhancing other mind/body skills. Designed to be enjoyed again and again, the pages of these books are filled with laughter, learning, movement and more. Martha’s books are: Leap… Laugh… Plop, Guess… Giggle… Wiggle, and Kick… Catch… Buzz. What is the one thing you can do for yourself and your child that will have the biggest impact on your body and brain? If you said exercise, you were right. We all know that getting your body moving is great for your health but did you know it is just as important for good brain health. That’s right, when you and your child get up and moving it actually helps increase learning. • “Being active grows new brain cells. • Balance improves reading capacity. • Movement can help reinforce academic skills for all students. Tour with VBT-Writers on the Move through April. New and famous authors, plus useful information. In what's got to be an incredible first, online literary magazine The View From Here has signed an agreement with 14 highly regarded publishing houses including Random House Bloomsbury and Penguin Books. Under the Publishers' View Agreement The View From Here will work with key people in the industry from around the world to help publishers identify fresh new talent. "We look forward to working more closely with The View from Here, a creative, forward-thinking magazine that will help us spot and promote new talent." 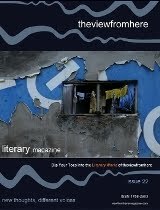 Mike French, the Senior Editor of the magazine, said, " We want to build on our reputation for championing and encouraging the best emerging writers and poets and the Publishers' View Agreement gives us the means to achieve that. Historically, literary magazines have been a way for talented writers to get their work out there and get noticed by Publishing Houses but we wanted to build on this and have a clear structured channel so this process wasn't left to chance." In a climate where literary consultants advise writers to avoid the slush pile at all costs this is a new and exciting way to get noticed. And unlike many routes to bypass the slush pile, it doesn't involve hours of networking every day to get noticed and more importantly the process does not take a fee from authors at any stage of getting their work infront of the editors, and in some cases, directors of the publishing houses. In a climate where access to those with influence normally comes with a price tag ( literary consultancies will often take a cut from an author's advance if they represent them ) the Publishers' View Agreement means effective help for writers without seeing them as a source of income. And as the majority of writers earn comparatively little we believe this is a socially responsible scheme. Technology is ever changing. It’s almost impossible to keep up with the latest news, gadgets, and trends, especially when it comes to e-books and reading habits. Authors Carolyn Howard-Johnson and Magdalena Ball are always keen and ready to meet their reader needs, and when Smashwords announced its new deal with Apple to produce formats suitable for the iPad and Apple’s new iBookstore, the authors immediately agreed, and jumped into action, pulling together the appropriate formatting for all of their celebration series books and putting them forward for conversion. The celebration series has been designed specifically to replace the trite, cliché sentiments of greeting cards, at prices that are little more than the cost of a high end card. Many of the books are beautifully illustrated with paintings or photographs, with poetry designed along themes that focus on mothers (She Wore Emerald Then ), fathers and other men (Imagining the Future ), and love Cherished Pulse More books are in the works. Hard copies of all the books are available at Amazon, or you can pick them up in whatever format suits, including the iPad, Kindle, Epub (Stanza reader), .pdf, LTF (for Sony reader), and more at Smashwords. As far as Howard-Johnson and Ball are concerned, whatever format suits their reader suits them. It’s all good. If Donny could’ve somehow unraveled the wires in his brain so that thinking came easily, he would have eventually forgiven them. All those barren years they had prayed for a child, until finally in disgust Donny’s father had decided, “No more prayers. What’s meant to be will be. No more knocking at Heaven’s door.” If Donny could have, he would have taken pity on the two of them: his proud, exasperated father and his brokenhearted mother. And Tina smiled at Milt, but they both knew it was insincere. Autism. Donny at three. The pediatrician explaining how it wasn’t the end of the world, but the diagnosis fell on Donny’s parents like a ton of lost dreams. Donny sat still on the white table. When Tina walked over to the table and affectionately squeezed him, he did not react. His brown eyes scanned the room, jumping from the desk to the ceiling to the doctor to his parents to the white walls hardly visible behind the twenty or so framed degrees and awards that told the story of Dr. Peterson’s career. What those eyes saw never made it back to Donny’s tangled-up brain. Dr. Peterson explained autism to them, but neither was listening. All those years waiting. Then this. It wasn’t fair. But what was even less fair came later. Milt and Tina gave Donny hardly any attention. He could not speak except for grunting whatever he was feeling but could not communicate. It especially unnerved his father while his mother would try to speak over those sounds till it got so that Milt did more and more overtime at work, not for extra money but for some quiet peace. Salvatore Buttaci is an obsessive-compulsive writer who plies his craft everyday. His work has appeared widely. He was the 2007 recipient of the $500 Cyber-wit Poetry Award. His collection of 164 short-fiction stories, Flashing My Shorts, is available from All That Matters Press or from Amazon.com. He lives with his wife, Sharon, in West Virginia. NOTE FROM SALVATORE: Aggie, the good news of my contest win comes on the same day I will be taping an interview on our local NBC-TV station to run this Sunday at 9:00 a.m. here in southern West Virginia. The show is called “In Focus” and I will get the opportunity to speak about my writings, especially about my new book Flashing My Shorts. Ann’s eyes sparkled when she saw this book lying on a corner table in the attic. What was next to it? It looked like a magic lamp. A few other interesting bric-a-bracs lay scattered around. Ann inched closer towards the table. Her grandmother had recently expired and she had accompanied her mother to this rambling old house. The assets were to be divided and the house sold. She could hear Uncle Neil and Mama arguing again. Ignoring the shrill voices emanating from the living room downstairs, she looked closely at the book cover. “The Velveteen Rabbit”, it read. Ann always wanted a pet rabbit, but they lived in a tiny cramped flat in a crowded city. A rabbit will not be happy in a tiny cage, her mother had patiently explained, over and over again. Yet, whenever she passed a pet shop, Ann could not help halting, even if, to just peer through the windows. Ann dusted the book and opened it. The childish scrawl on the front page was faint with age, perhaps it said: Hazel. “Oh, this is Granny’s book”, said Ann to no one in particular. Hugging the book tightly to her chest, she ran downstairs. “Mama, Mama, I want to keep this book”, she pleaded. Uncle Neil roughly pulled the book from her, flipped open the pages, said it was a worthless piece of junk and that she could have it. Mama had smiled and told her to run out and play. Back home, tucked in bed, Ann began to read the book. It was about a toy rabbit who wanted to be a real rabbit and whose wish came true. “I wish my wish would come true, Mama”, she said, as her mother kissed her goodnight and switched off the lights. Ann was lonely. Her mother caught up in her work and household chores was never around. She used to meet her father over weekends, but now he had moved away to another city. Phone calls from him were getting less frequent. A silent tear rolled down Ann’s cheek as she fell asleep. The days rolled on, the book lay on a shelf, quite forgotten. Till one day, Mama told her that they were moving to a large house in the suburbs. Some art which Granny had in her house had fetched a good price. Ann didn’t then know what art was, she didn’t care. She was so excited about the move. She remembered that she had rubbed hard on the magic lamp in the attic and had made a wish – for a fluffy white rabbit. Her pet rabbit – Velveteen and she would now play in the front yard of their new home. Today, twenty odd years later, as a struggling artist, holding a temporary part time job to make ends meet, Ann looks back on the day she walked into the dusty attic. She knows there is no place for pessimistic disbelief in her life. “You need to tread on the path of wonder, joy and trust and you don’t need a magic lamp to achieve your dreams”, she tells her friends. She knows that someday soon she will be a success and she heads back to her tiny studio to paint her dreams. Lubna Kably is based in the busy city of Mumbai, India. While she is a number cruncher by profession, she loves writing – especially travelogues which appear occasionally on various portals. One of her submissions was accepted by Traveler’s Tales in their compilation of funny gut-busting misadventures: The Thong Also Rises. She is currently experimenting with Haiku and this is her first attempt at writing something unrelated to travel or taxes.